The North Melbourne Football Club was founded in 1869 and became known as ‘the Kangaroos’ in 1950. 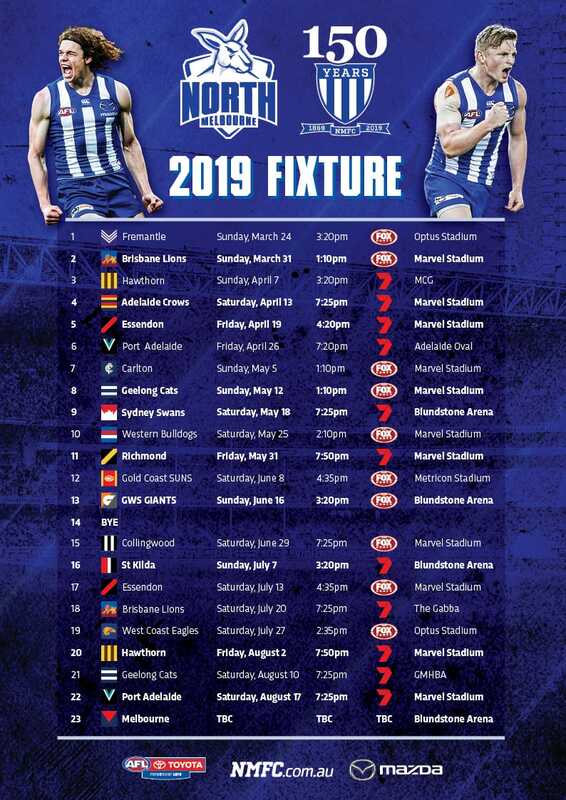 The fourth oldest football club in the Australian Football League and one of the oldest in the world, North Melbourne’s administration and training facility is based on Arden Street in North Melbourne. League games were played at the venue, but the club’s home matches are now held at Marvel Stadium, Docklands. The club was inducted into the Victorian Football League in 1925 and is characterised by its inner-city location, working-class background and a determination to succeed, even against the odds. The club has an envied culture and those lucky enough to have played in the royal blue and white are dubbed "Shinboners"; a term which dates back to the 19th-century and local abattoir-workers. The phrase ‘Shinboner Spirit’ is synonymous with the club. The club's motto is Victoria amat curam, Latin for "Victory Demands Dedication".